Reading and share top 26 famous quotes and sayings about Growing To Love by famous authors and people. Browse top 26 famous quotes and sayings about Growing To Love by most favorite authors. 1. "People who do not love themselves can adore others, because adoration is making someone else big and ourselves small. They can desire others, because desire comes out of sense of inner incompleteness, which demands to be filled. But they can not love others, because love is an affirmation of the living growing being in all of us. If you don't have it, you cant give it." 2. "I love you, with a love so great that it simply couldn't keep growing inside my heart, but had to leap out and reveal itself in all its magnitude." 3. 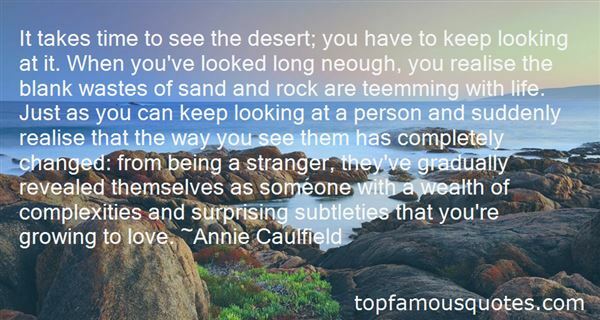 "It takes time to see the desert; you have to keep looking at it. When you've looked long neough, you realise the blank wastes of sand and rock are teemming with life. Just as you can keep looking at a person and suddenly realise that the way you see them has completely changed: from being a stranger, they've gradually revealed themselves as someone with a wealth of complexities and surprising subtleties that you're growing to love." 4. "Being a kid growing up with Kurosawa films and watching Sergio Leone movies just made me love what it could do to you, and how it could influence you - make you dream." 5. "Remember how I woke you up? If you could have seen me during the 15 minutes before your wake-up call, you would have seen a man watching a woman sleep. You would have seen the tenderness in his eyes. You would have seen a smile on his lips. And if you had looked super-super hard, you just might have seen the love growing in his heart." 6. "By the time I rose and started walking again, I didn't begrudge my mother a thing. The truth was, in spite of all that, she'd been a spectacular mom. I knew it as I was growing up. I knew it in the days that she was dying. I knew it now. And I knew that was something. That it was a lot. I had plenty of friends who had moms who—no matter how long they lived—would never give them the all-encompassing love that my mother had given me. My mother considered that love her greatest achievement." 7. "It was altogether a different story now. Abhilasha started coming out of the cold aloofness which had become her second nature, while for Arvind, it was like ‘fiddle found a melody'. He was in love with his life again. With their growing intimacy, came the desire to meet each other. And at last it materialised when they fixed a date for meeting. The long awaited day came. A sleepless night of nervous apprehension, culminated at dawn, as Abhilasha could no longer lie down. While there was much excitement at the prospect of meeting him but the possibility of a probable mismatch between the real Arvind and the virtual one, loomed large on her mind, making her feel nervous." 8. "I like health-conscious cooking, but growing up in the South, I do love southern cooking; southern France, southern Italy, southern Spain. I love southern cooking." 9. "I thought I'd love to be a gardener because I grew up with a vegetable garden and I love being close to the Earth and growing things. At my home in L.A., I have a great garden and I grow all kinds of things. I even have a worm farm! The worms help create organic compost out of kitchen scraps." 10. "I love going for a swim. Growing up in England, anywhere with a pool seems like the height of glamour to me." 11. "(...) - So you mean that even having the power to interfere and prevent your childfeel pain, you would choose to show their love letting him learn hisown lessons?- Sure, pain is part of growing up. It's how we learn.The camerlegno shook his head.- Exactly. "p.89"
13. "And Ásta Sóllilja, it was she who swept on wings of poetry into those spheres which she had sensed as if in distant murmur one spring night last year when she was reading about the little girl who journeyed over the seven mountains; and the distant murmur had suddenly swelled to a song in her ears, and her soul found here for the first time its origin and its descent; happiness, fate, sorrow, she understood them all; and many other things. When a man looks at a flowering plant growing slender and helpless up in the wilderness among a hundred thousand stones, and he has found this plant only by chance, then he asks: Why is it that life is always trying to burst forth? Should one pull up this plant and use it to clean one's pipe? No, for this plant also broods over the limitation and the unlimitation of all life, and lives in the love of the good beyond these hundred thousand stones, like you and me; water it with care, but do not uproot it, maybe it is little Ásta Sóllilja." 14. "I love movin'. I was observant growing up, watching Michael Jackson and John Travolta. I'd close my eyes, see the moves." 15. 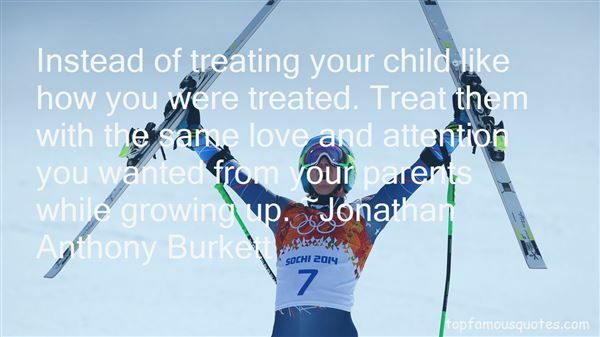 "Instead of treating your child like how you were treated. Treat them with the same love and attention you wanted from your parents while growing up." 16. "From these foolish embraces, which were not of very frequent occurrence,I must allow, I used to wish to extricate myself; but my energies seemedto fail me. Her murmured words sounded like a lullaby in my ear, andsoothed my resistance into a trance, from which I only seemed to recovermyself when she withdrew her arms.In these mysterious moods I did not like her. I experienced a strangetumultuous excitement that was pleasurable, ever and anon, mingled witha vague sense of fear and disgust. I had no distinct thoughts about herwhile such scenes lasted, but I was conscious of a love growing intoadoration, and also of abhorrence. This I know is paradox, but I canmake no other attempt to explain the feeling." 17. "His weekly golf game no longer keeps his love handles in check, he's recently resorted to a slight comb-over to cover that growing bald spot, he squints to avoid wearing the bifocals he hides in his desk drawer, and he spends his days in an office filled with decades-old sports trophies." 18. "I didn't know how I could live with that knowledge, without it eating me up, without it poisoning every happy memory I had of growing up. Without it ruining everything Beck and I had.I didn't understand how someone could be both God and the devil. How the same person could destroy you and save you. When everything I was, good and bad, was knotted with threads of his making, how was I supposed to know whether to love or hate him?" 19. "My Dearest Allie. I couldn't sleep last night because I know that it's over between us. I'm not bitter anymore, because I know that what we had was real. And if in some distant place in the future we see each other in our new lives, I'll smile at you with joy and remember how we spent the summer beneath the trees, learning from each other and growing in love. The best love is the kind that awakens the soul and makes us reach for more, that plants a fire in our hearts and brings peace to our minds, and that's what you've given me. That's what I hope to give to you forever. I love you. I'll be seeing you. Noah"
20. "I can feel my heart growing daily, which has its uncomfortable aspects, as if it could fall with the weight of love and break." 21. 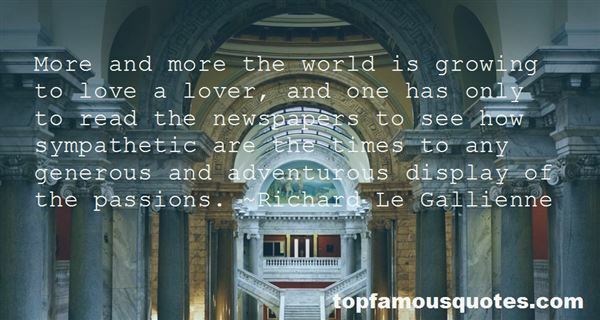 "More and more the world is growing to love a lover, and one has only to read the newspapers to see how sympathetic are the times to any generous and adventurous display of the passions." 22. "I love being the bad guy, simply because I was always so responsible, so predictable growing up." 23. "Connecting in sips may work for gathering discreet bits of information, they may work for saying, "I'm thinking about you," or even for saying, "I love you," but they don't really work for learning about each other, for really coming to know and understand each other. And we use conversations with each other to learn how to have conversations with ourselves. So a flight from conversation can really matter because it can compromise our capacity for self-reflection. For kids growing up, that skill is the bedrock of development." 24. "This was another item about growing up: you encountered all the cliches of love and loss and heartbreak." 25. "I love you in–in every kind of way. '‘I feel like that too . . .' His voice is shocked and raw. ‘It's – it's a feeling so big I sometimes think it's going to swalow me. It's so strong I feel it could kil me. It keeps growing and I can't – I don't know what to do to stop it. But – but we're not supposed to do this – to love each other like this!" 26. "People say when something stops growing, it dies; I don't think it's the same with love. Even when love stops growing because there's nothing to nurtures it, it doesn't die; it just stays somewhere in a limbo." You can't flirt with me during a lockdown. My eyes narrow. It's unethical."